I've never been much of a reader but I'm starting to kinda like it. So for the first time in a long time I've actually read a couple of books this year. I finally have a little more time on my hands with the 3 big boys being in school and Grayson taking good naps in the afternoon (and All My Children being cancelled). So here are the books I've read this year. I know its not that many but in all fairness, I didn't start until summer. I know everyone else read this by middle school but I finally read the whole series this summer and actually enjoyed it. Some books I liked more than others and I did like the ending of it as well. 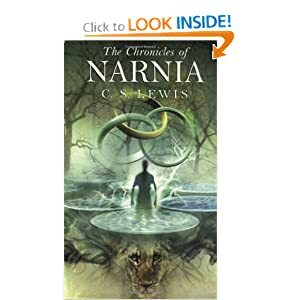 I've never read anything by CS Lewis (very surprising since most baptist kids adored him) and I'm pretty sure it was the first series of books I've read as well. They maybe pathetic but growing up I read a lot about planes, sharks and other interests I had. I never read much fiction. If you are needing a good cry, this is the book. It is Angie's story of carrying to term their 4th daughter even after being told that she would not survive. Angie started a blog around this time called, Bring on the Rain, that I used to read. She is a very good writer, especially when telling her own story. My favorite quote, "Joy is not the absence of trouble but the presence of Christ." Angie quotes this in the book but doesn't share the reference. She also writes about how to help others in a similar situation and how to help children grieve. One of the chapters is also written by her husband so you can see the difference in how each of them grieved. I wanted to like this book but I just couldn't get into it. I'm sure most of it was religious differences but it just didn't seem to be that deep nor that doctrinal sound. I loved the premise, taking the natural fears we have and how people from the scriptures handled those fears and were able to do miracles in spite of them, however most of it just felt like it was her opinion with no scripture to back up her thoughts. I did love the last two chapters of the book. One was on Peter walking on the water and the last one was on fearing God. I did like these two thoughts as well, "He (Christ) can be glorified in spite of our mistakes." and the one from Peter walking on the water, "God will still be God if you stay in the boat. But He won't be your God unless you get out." I also liked how she shared her personal stories in the book to prove her point. She had some funny ones. Also, the real reason I read it so quickly, it was written in such a way that it left me with two questions, What the heck did Minny do to the pie and Why was her maid fired. I couldn't stop reading until I knew the answers. We went crazy one day and got a dog and not just any dog, a type of dog that is known for their hyper, crazy personalities. Because of this, I decided I needed to read some dog books. I had watched this special on tv and decided to read the book. It was worth it the most just to hear that 8 months-3 years is the adolescent period of dogs. We currently have a teenage jack russell in the house and I need to have patience! We have used some of his ideas on how to raise our little Lockett but we are not as strict. Maybe we wont have the perfect dog? But I just want one that doesn't poop in my house. and the Doctrine and Covenants. FYI, in case you can't tell, all images are from Amazon.